The Murray-Darling Basin Authority is relying on out of date data for its recommendations to take 2,750 gigalitres from productive use in the Murray-Darling Basin, said Senator Barnaby Joyce today. “We are borrowing billions from overseas to buy water, which could put towns out of production, in the middle of a flood period. There must be something slightly incongruous about this, which at the very least requires the updating of models with easily accessible current information. “It was revealed at Senate estimates today that the MDBA has calculated the average inflows into the Murray-Darling by taking a simple average from 114 years of data, from 1895 to 2009. “There are lies, damn lies and statistics, or so said Disraeli, but it seems convenient that the dataset used to calibrate water in the Murray-Darling Basin begins and ends with Australia’s two biggest recorded droughts. The federation drought conveniently becomes one bookend of the statistics, and the recent millennium drought becomes the other. The other side of these two periods are some of the wettest times in Australia’s history, the one we are living through now and the one that included the 1891 floods. “At least the figures should be current and include the most recent figures, as I continually hear this discussion about current changes to climate. The data must surely include the current rain events that have flooded my local town three times in the last two years, which we have all no doubt seen on the news. “We are going to spend over $100 million just developing the Basin Plan which is not even based on up to date information. Why is it that every time the Labor party involve themselves with anything that relates to competency it turns into an unmitigated disaster? Why is it that every time you look to the details behind their doorstop interview they are just never there? There is a pattern of behaviour that is quite evident in this Green-Labor Party administration. When they announced the NBN, the largest infrastructure program in the nation’s history – larger than the Snowy Mountain Scheme – there was no cost benefit analysis, and of course we are now suffering the affliction of a monster that is starting to commercially wander around the yard in a very similar fashion to a big white elephant. Our desire to cool the planet via a carbon tax works on the rather peculiar premise that there will be a global climate change agreement by 2015. There is not even a sign of that, but we handed away one of our greatest strategic advantages, cheap power. Australia’s plan is nothing more than a mad gesture which no-one else is following and no-one cares about. On top of this, the only climatic effect it will have is inside buildings rather than outside, as people find they can’t afford to keep themselves warm in winter and cool in summer. Now this pathological ineptness in management has arrived in water policy. Your government is now the biggest irrigator in the country through the Environmental Water Holder, Ian Robinson, but instead of watering spuds and onions, they water 2,400 venues for frogs and swamps. Mr Robinson only wrote this in July this year but it is already out of date. The draft Basin Plan released last month does not include an environmental watering plan. Instead, that task will now be flicked to state governments, who won’t need to come up with one for another three years. A farmer will tell you exactly how they get their water, exactly how much water is stored in dams, how much water is lost when it is moved to a field to water a crop and how much water it takes to water a crop through the season. They will also be able to tell you how much is left to start next year’s crop. Every farmer has their watering plan. If a farmer didn’t have a watering plan, they wouldn’t be much of a farmer. The Commonwealth Environmental Water Holder currently has 1,075 GL – 1,075 billion litres – of water. Quite a bit; in fact more than what would fill Sydney Harbour twice and they are buying much more. This is to water 2,442 environmental assets, 2,442 environmental crops so to speak. But when the very valid question is asked, “where is your watering plan?” the predictable answer comes back – they don’t have one. It’s obviously in the draw with the cost benefit analysis of the NBN, the global modelling of the carbon tax, the plan to control our debt, and a myriad of other incredible statements that come without a clue of how to deliver them. Australia is merrily spending billions of dollars buying an asset but there is really no plan of where exactly it will come from, how it is to be used or where it will be stored. There is a rough idea, but that’s as good as it gets. When there is no plan, the environmental water is dropped arbitrarily in the river from public dams to flood out farms and close public bridges like it did on the Murrumbidgee earlier in the year, at a time when there was not a cloud in the sky. The environmental benefit of these actions is at best vague most likely unknown. If I was back with my accountancy hat on, I would make sure I got my money off this Green-Labor client prior to starting their work; from what I have seen they are not going to be with us as a business for long. The Murray-Darling Basin is often viewed as a network of inter-connected garden hoses, where if you drop a litre of water in at Toowoomba, and wait long enough, it will eventually all run out at the Lower Lakes in South Australia. The reality is that it is more in the nature of a big old dry carpet laid flat on your back lawn. If you tip a bucket of water at the top end it is highly unlikely to wet the feet of someone standing in the far lower corner. For an example, the town of St George is over 1,500 km from the mouth of Murray yet it is only 200 metres higher than sea level. You can only move water across a carpet if it is saturated. 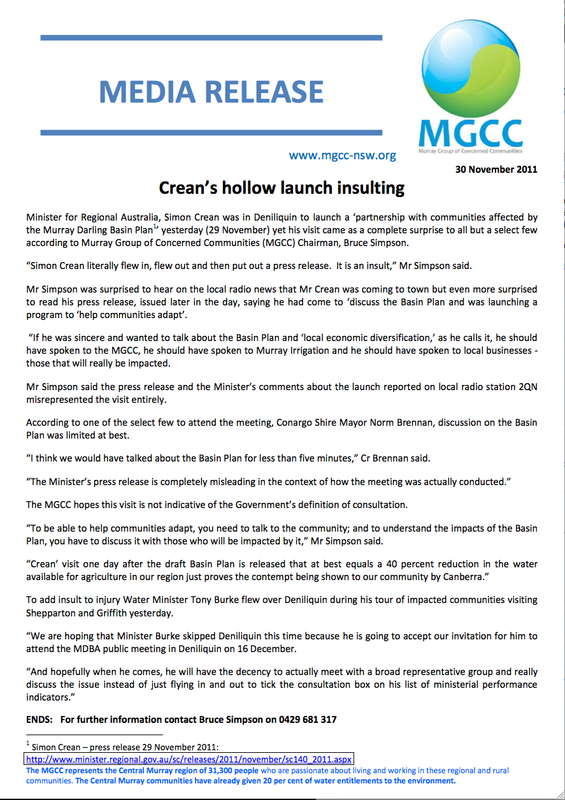 The virtual release of all but the actual draft to the Murray-Darling Basin Plan appears to be dire for my area of St George and many other agricultural towns. Showcasing the Murray-Darling Basin Authority’s aptitude for inclusive consultation, ABC’s Lateline has got a copy before the people of Renmark, Mildura, Deniliquin or Dirranbandi. There are 2.1 million Australians who live in the Basin, and many of its towns were built to produce 40 per cent of our agricultural output, helping to feed the nation and export produce to support our standard of living. So it will be interesting to see how much water will be actually delivered to the political pressure point of the Lower Lakes. It will only be a fraction of what is so called “returned to the river”. Along the way how many towns, without any discernable connection to the Lower Lakes, will be economically butchered and how many export dollars lost to be replaced with even further imports by Labor’s latest fiasco, the draft Plan for the Murray-Darling Basin. Last year the government released the Guide to the draft and it was recognised by all, except the Greens, as an economic and social disaster for regional Australia. Canberra is in the southern basin and, under the Guide last year, it would have had to live with permanent stage 3 water restrictions. Canberra is spending over $300 million on Cotter Dam but it would not have been able to use the water in it. The government announced a House of Representatives committee. It made 21 recommendations, the government has accepted one. The Guide proposed to reduce the productive use of water in the southern Basin by 2,322 gigalitres. By the leaks we have so far, the draft proposes to reduce water use by 2,290 gigalitres. For all the sound and fury of Mr Windsor’s committee, for all the government’s assurances that it would listen to communities, the current plan is 98 per cent of the previous plan. If the Guide led to virtual riots, it is not clear how the draft will lead to peace in our times. Even worse, reports suggest that the Authority has not bothered to develop a detailed “environmental watering plan”, which would clearly define the areas and times when frogs and wetlands are more important than people. Who would be crazy enough to reduce our capacity to feed ourselves without clearly knowing why? The same people who are trying to reduce the temperature of the globe from a room in Canberra, the Labor party. Like the carbon tax, the Greens will drive the agenda. The mortgages on houses for those living in Basin towns, well they are just collateral damage as they strive toward their goal of returning water, removing commerce and replacing Australian food with imports. The shutting down of agriculture means Australia is even further reliant on mining in our “one string to the bow” economy. Food inflation will sky rocket when the dollar depreciates, and at some stage it will, if we are insistent on shutting down our food producing regions as we are doing in this so called plan. It appears the plan for Australia under the Green-Labor-Independent alliance is to shut down manufacturing with a carbon tax, shut down agriculture with a Murray-Darling Basin Plan and shut down our access to funds with massive debt. They are the most negative because they are the most incompetent government in history. The result for urban Australia is you are about to pay a lot more money, for everything. The Qantas chief, Alan Joyce, has been hanging around Parliament House for the past few weeks, not because of an impending aviation calamity, but apparently because he likes the decor and the coffee. Well, that is what you would have to believe if you are to believe the Government. To say the Qantas lockout and fallout came as a surprise does not pass muster especially now in light of the abundant leaks from key Labor Party ministers, all protecting their jobs in the shadow of this fiasco, so as to quarantine themselves from the political fallout in the rumoured leadership change. Julia Gillard wrote the Fair Work Act when she was Industrial Relations Minister in 2009. Section 431 allows the minister to demand the parties come to the table and avoid the massive damage which has happened to the nation’s airline and our nation’s image. The Government had at its disposal the mechanism to avoid the travel chaos over the weekend. However, Gillard was not convinced of her own competencies in writing the Act or her Government’s capacity in administration of her own Act. She claims that section 431 could not be used because it has not been used before. Well, why did you put it there? It appears she did not even source legal advice until Saturday afternoon. Breathtaking! Our nation’s Government is not on auto pilot – it is rudderless, clueless and hopeless. The Qantas dispute is a metaphor for the Government’s day-to-day management as we lurch from crisis to crisis. It is the same management style as the live cattle debacle which brought about a middle-of-the-night closure of the live cattle trade that we did not need while creating an immense diplomatic issue with our largest neighbour. From overreaction to no reaction at all; in fact with the Qantas issue to a position where we are in a desperate search for a government pulse. The vision of flying back into Canberra this week, on a very crowded Virgin flight, was one of a government fascinated in cooling the planet while we raced past $215billion in gross debt. Qantas planes sat forlornly on the tarmac as a new aviary for swallows. But then the Qantas debacle is not a new pattern for the Government. During the election last year Gillard promised to implement whatever the Murray-Darling Basin Authority decided. After the authority released a plan that was a dud, the Government backed away, and started blaming us for introducing the Water Act. Now the Murray-Darling Basin draft plan is about to be released and the Government will have to display a competency, completely absent at the moment, to avoid the public furore which occurred last year. Coal seam gas is an issue that has to be addressed in a more complete manner, as demanded by public concerns, but no senior Labor Party members are offering any solutions. At the moment they seem more obsessed with CO2 than H2O. Labor has provided the apogee of its political engagement with Australians with the carbon tax even though Canada is running a thousand miles from any similar action, and Europe has a scheme which is little else than tokenism supported by a volatile and at times fraudulent carbon market, where the scams associated with carbon credits would make pyramid scheme marketers blush. China is improving the carbon intensity of its economy by pulling down dirty little coal-fired power stations and building massive new coal-fired power stations. Absurdly, we will pay China for the carbon credits it generated in its country under our carbon tax with money borrowed from them. Yes, the carbon tax legislation was finalised with a back-slapping, clapping, kiss-a-thon mirrored in the big banks with a salivating let’s go out to lunch on Bob Brown’s big bank billion dollar bonus as the commissions on the permits transfer money from the suburbs to the centre of town. In a political team when it becomes apparent that the halfback cannot pass, the five-eighth cannot catch and the coach is a plant from another greener team, then the crowd of supporters dismally dwindles to a core of the loving family members, the morbidly curious and those recently removed from the closest pub.